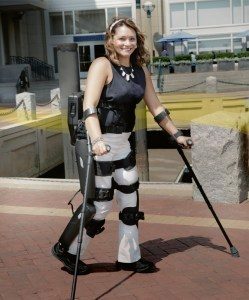 It’s More Than Walking – ReWalk is a wearable robotic exoskeleton that provides powered hip and knee motion to enable individuals with spinal cord injury (SCI) to stand upright and walk. ReWalk is the first exoskeleton to receive FDA clearance for personal and rehabilitation use in the United States. The ReWalk Personal System 6.0 is designed for all day use at home and in the community. The ReWalk is custom fit for each individual and provides the most precise fit and highest walking speed of any powered exoskeleton. ExercisABILITIES is a trained site for ReWalk. We will schedule onsite trial days if you are interested in an evaluation and trial with the Unit. There is no obligation to you in being assessed. For this opportunity, Contact us today!